The wide range of stylish, capable Thin Mini-ITX-based all-in-one PCs combined with interoperable Thin Mini-ITX desktop boards and compatible components is intended to promote innovative solution design for business and home use. Make use of available online resources to support Thin Mini-ITX-based all-in-one PC solution design and integration. 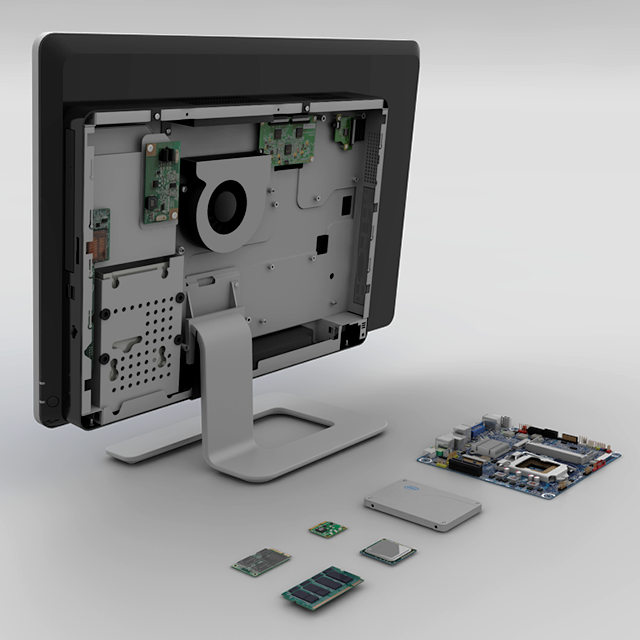 The wide range of Thin Mini-ITX-based all-in-one PC chassis promotes solution design for targeted compute needs. When designing a multi-touch capable solution, including an infrared remote control, planning to VESA mount the system or require high definition integrated webcam and dual microphone capability, choose an all-in-one PC chassis that supports desired features. There are many Thin Mini-ITX boards available and interoperable with the locally available all-in-one PC chassis. It is essential to verify support for specific component choices at design stage. The appropriate mix of external I/O ports, internal USB headers, internal Mini PCI Express* connectors, and additional support for components such as consumer infrared (CIR) should be specified at solution design stage. Thin Mini-ITX desktop boards can support up to 65 watt thermal design power (TDP) processors, which means you can scale performance to the higher end of available desktop processor models. Many desktop boards support up to 16 gigabytes of DDR3 1600 MHz system memory, 6 Gb/s SATA drives, eSATA connections and mSATA solid state drives, high speed USB3, and Gigabit Ethernet. Where available, Mini PCI Express* connections that can be used for a combination of mSATA or PCI Express-based solid state drives, high speed wireless network adapters, TV tuner cards, and more. Choose an all-in-one PC chassis that is Thin Mini-ITX desktop board compatible and the right component mix to enable specific customer solutions. There are a number of resources available intended to support effective all-in-one PC integration. Browse the pages on this site for product specific resources.